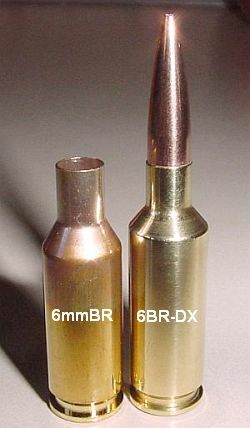 The 6BR-DX is an improved version of the 6mm BR Norma cartridge, with a 40° shoulder and a bit less body taper than a Dasher. The shoulder is .462″ (just a couple thousandths bigger than a standard case) and the diameter at the web is .470″. 6BR-DX water capacity is about 39.5 grains. That’s about 1.5-2.0 grains more than a standard 6BR case, depending on your chamber. With the extra boiler room provided by the BRDX, David Stripling can stuff 34+ grains of RL15 into the 6BR-DX, even though the neck, at 0.283″, is just .039″ shorter than a standard BR. With the added capacity, David can launch Berger 88s at nearly 3300 fps, or Berger 95s at 3200 fps. 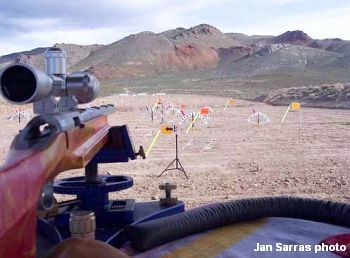 Share the post "New "Short Dasher": The 6mm BRG"
On July 20-22, the NBRSA 1000-yard Nationals will be held at the Palamino Range just outside Reno, Nevada. Competitors will shoot both Light Gun (17-lb max) and Heavy Gun (Unlimited) Classes. The format is SIX targets each day if you shoot two (2) classes, or THREE targets each day if you are shoot one (1) class. Friday the 20th is a sign-up, weigh-in, and practice day. If you need to shoot to practice or zero, there is a $10.00 range fee on Friday. For the match, the Entry Fee is $20 per day per gun. You can still register and compete. However, pre-registration was required 30 days before June 20th. A $40 late fee will be applied for late registration. Match is July 21st and 22nd. Local information and Registration Form are found on the Palomino Valley Gun Club website. For more info contact Bob Hoppe at (775) 397-3358. Share the post "NBRSA 1K Nationals July 20-22 (Reno, NV)"